Welcome to the EZYDog Giveaway! EZYDog makes the perfect products to make outdoor experiences with your dogs fun and comfortable. At EzyDog you can find the latest sports technology with the durability that dog owners love. Not only are the functional, but they are more comfortable for both owner and dog. 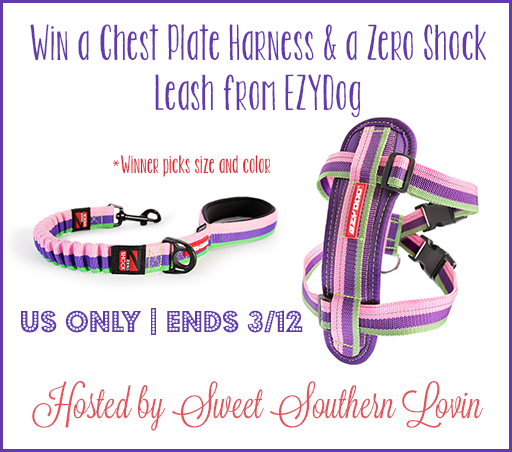 Michelle at Sweet Southern Lovin had the recent opportunity to review the Zero Shock Leash and Chest Plate Harness for her Rottweiler, Lola. Head over here and check out her full review. I really like the Doggy Floatation Vest. I think that would be great for my Beagle while on our boat. My favorite product actually is this! The Bubble Gum colored harness and leash! It would be perfect for our labrador retriever! like the CLICK Adjustable Car Restraint. Thanks. I like the life jackets! I want the handy leash. I like the Handy Leash…never seen one like it!